The front O2 sensor (Sensor 1) measures the amount of oxygen in the exhaust before the catalytic converter. The engine computer (PCM) supplies the reference voltage to the front O2 sensor. The sensor sends the voltage signal back to the PCM. The low voltage signal means lean air fuel mixture, or too much oxygen and too little fuel. The high voltage signal means rich air fuel mixture. The code P0131 is set when the signal voltage from the front O2 sensor is stuck low. In modern cars, the air fuel ratio sensor (A/F sensor) is used instead of the O2 sensor, but it's also often referred to as a front O2 sensor. Bank 1 is the bank containing the cylinder number 1. In a 4-cylinder engine, there is only Bank 1. - corrosion or bad connection in the front O2 sensor connector. - bad sensor or PCM ground connection. - sensor wiring short to ground (e.g. the wiring is rubbing against the exhaust or a bracket. - blown or missing PCM O2 sensor reference voltage circuit fuse. See: how to check a fuse. - open or short to ground in the PCM O2 sensor reference voltage circuit. - lean air fuel mixture caused by: vacuum leaks, stuck-open EGR valve, leaking purge valve, low fuel pressure, bad PCV valve, dirty air flow sensor or other reasons. When the air fuel mixture is lean, the engine may also lack power and run rough at idle; the codes P0171 or P0174 may also be present. - the PCM may need to be reprogrammed. - faulty PCM, although it's rare. According to a service bulletin for 1998-2000 Honda Civic, a bad EGR valve can cause the code P0131 or poor engine performance. The solution is to replace the EGR valve. Read more: EGR valve: problems, symptoms, testing, replacement. In some first-generation Mazda 3 and Mazda 5 cars, the oxygen sensor wiring may rub against the edge of bracket holding the front O2 sensor connector, causing codes P0131/P2251. There is a service bulletin on this issue. If the harness is damaged, the bracket must be modified and the A/F sensor (front O2 sensor) must be replaced. We found a service bulletin for Chrysler 300 and Dodge Magnum/Charger. 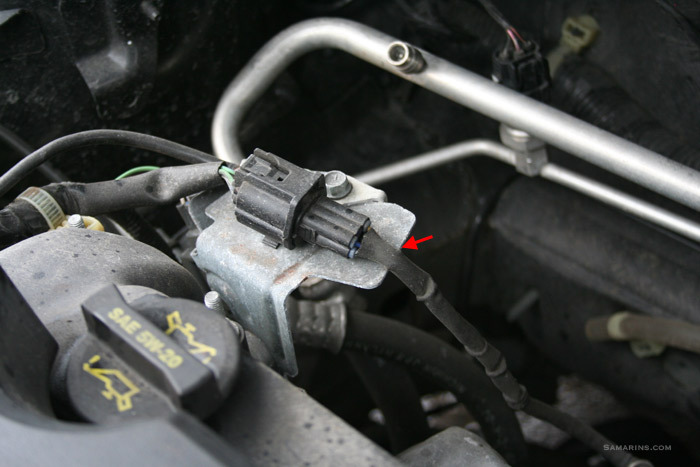 The code p0131 or some other O2 sensor codes can be caused by water flowing from a cowl drain on to the O2 sensor connectors at the center rear area of the engine. If corrosion is found at one of the connectors, the harness connector must be replaced with a repair kit. Another Chrysler bulletin for 2010-2012 Ram pickup truck with Cummins 6.7L engine recommends repairing the O2 sensor harness if one of the O2 sensor codes, including P0131, are present. A TSB for the 2015 Ford Transit with 3.7L engine describes a problem where the wiring harness may rub against the back of the cylinder head causing P0131 and other codes. The fuse F36 may also be blown. The repair procedure is described in the bulletin. Another bulletin (TSB 15-0118) for the 2015 Ford Transit with the 3.7L engine describes the problem where the air cleaner element saturated with water can also cause the code P0131 and other codes. The solution is to install water diverter and replace the air cleaner element. In a European 1996-2008 Ford Ka and 2001-2008 Fiesta the code P0131 along with other O2 sensor codes could be a result of overheating of the heated O2 sensor (called lambda probe). According to the service bulletin, the engine computer must be reprogrammed and the lambda probe replaced with an updated part. In many cars, including Chevrolet, GMC, Jeep, Subaru and Honda vehicles, the code P0131 can be caused by a failed air fuel ratio sensor. Replacing the sensor often fixes the problem. In some cases, the engine computer (PCM) must also be reprogrammed. If you are planning to do the repair yourself, you will need a special oxygen sensor socket that you can purchase or in a part store. Chains like AutoZone and O'Reilly's offer a loaner tool program, where you can simply borrow a tool to do the repair. Reprogramming of the PCM can be done at a local dealership. First, check for service bulletins. If it's a known problem with the vehicle, the car manufacturer might have issued a service bulletin describing the repair. Google P0131 bulletin along with the make model and year of your vehicle and you may find the related service bulletin. 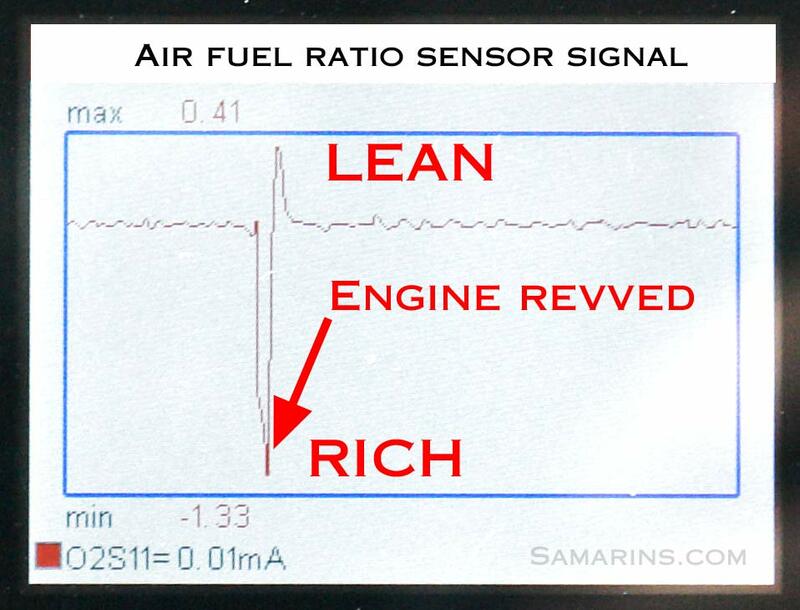 Checking the air fuel ratio sensor with a scan tool: when the engine is revved, the signal jumps to "rich", then as the RPM drops and the fuel is cut off, the sensor indicates "lean". After that, the signal goes back to normal. This air fuel sensor works properly. If the code P0131 is caused by mechanical reasons, such as vacuum leaks, leaking purge valve or EGR valve, there will likely be other symptoms, including rough idle and lack of power. Another codes related to the EGR valve or purge valve may be present. In this case, other codes will need to be checked first. Initial visual inspection includes checking the sensor connector for corrosion or loose pins. The sensor harness must be inspected for possible damage from the contact with exhaust or other parts. To diagnose the code P0131, you might need to get the sensor diagram and the manufacturer-specific diagnostic procedure. We posted several links at the bottom of this article, where for a subscription fee you can get access to the factory service manual and wiring diagrams. The ground, power and reference voltage at the sensor need to be checked first. If the voltage is within specs, the sensor must be replaced. It's easy to check the air fuel ratio sensor signal with a scan tool. The engine must be warmed up. 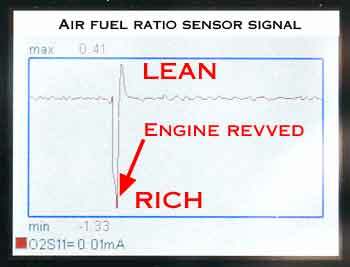 When the engine is revved, the signal must change to "rich" condition. See the diagram above.